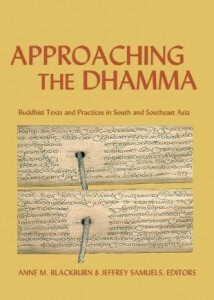 Approaching the Dhamma is a serie of essays from the foremost scholars in Buddhism and especially the buddhist practices of Southeast Asia. In three parts the book describes in a number of academic essays “Interpretation and Understanding”, “Ritual and Cosmology” and “Rebirth and Mental Culture. Approaching the Dhamma a is a collection of essays in honor of the late Godwin Samararatne. Although he was involved in various scholarly works, Godwin became best known as a meditation teacher, a role into which he grew over a prolonged period of time during the 1970s. Approaching the Dhamma a is a collection of essays in honor of the late Godwin Samararatne.